When the former West Java city of Banten became a separate province in 2000, this one time trading post soon ranked amongst Indonesia's wealthiest provinces. The boundaries now extend into parts of Greater Jakarta and one of Indonesia's most important industrial zones. However, the province of Banten also includes the Ujung Kulon wildlife reserve on Java's south-west tip, and several charming colonial buildings still stand in its namesake city. The city was actually once considered nearly as important as Amsterdam, as a bustling international port. The province may be one of Indonesia's newest, but the history of Banten dates back to the 5th century, when the region belonged to the Kingdom of Tarumanagara. Relics inscribed with two poetry lines written in Sanskrit describing King Purnawarman's bravery were unearthed in some of the surrounding villages in 1947. History books record that the Srivijaya Buddhist monarchy eventually defeated the Kingdom of Tarumanagara and remained in power until well into the 13th century. Around 1200 AD, Chinese customs inspector Chau Ju-kua wrote about a thriving port called Sunda, with good quality pepper and houses perched on poles. Many believe Banten was the port Chau Ju-kua described in his writings. 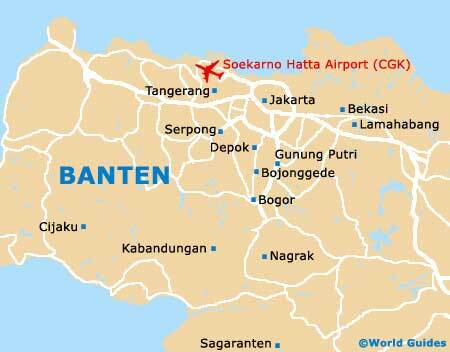 Portuguese explorer Tome Pires also referred to Banten as one of Sunda's most significant ports during the 16th century. In the 16th century, the area became the Banten Sultanate's seat and was heavily influenced by Islam. By 1603 the English and Dutch established their own permanent trading posts in the port. During the next 30 years, all English trading factories on India's Coromandel Coast reported here. After fighting heavily with the Portuguese for control of the city during much of the 17th century, the Dutch decided they could control present-day Jakarta more efficiently than Banten. It is thought that this decision contributed to its overall decline as an international port. Towards the end of the 17th century, Banten became a Dutch East Indies protectorate, which was eventually absorbed into its surrounding territory. When Thomas Stamford Raffles, the British statesman, forced Sultan Muhammad Syafiuddin to abandon his throne in 1808, the 240-year-old Banten Sultanate officially came to an end. The area then became a West Java division, which would later become part of the West Java province in 1925. Not much of significance happened in the history of Banten during the 20th century. Then in 2000, it made headlines when tens of thousands of its people asked the People's Representative Council to allow Banten to become its own province. Their wish was granted shortly afterwards. The province is still a picturesque seaport, but even though it is now overshadowed by its more economically prosperous neighbour, Merak, its past glory is still reflected in historic Old Banten.